As our United Airlines flight travels westward into the darkness of the horizon, my thoughts are filled with the unforgettable moments our team experienced this week. I have been journaling and remembering the miracles that we witnessed and am overwhelmed by the hand of God over our team, our travels, our ministry and most of all, the quinceanera. Without a doubt, the quinceanera was one of the most incredible events of my life. When Stephanie shared her vision for the quinceanera with me and our team last summer, I had no idea what God had in store. I am so proud of Stephanie, Amanda, Tanya, and the amazing team members who worked endlessly to create such an unbelievable evening for these precious young women. (1) One family from CA purchased fifty pairs of shoes for the girls and they absolutely loved them! For many, it was their first pair of brand new shoes. (2) Two women from our church made necklaces with heart pendants to give as gifts to each girl. They treasured these gifts, and will always have them as keepsakes. On the day after the quinceanera, we realized that we had exactly enough necklaces remaining to give to all of the female missionaries and translators who served with us! They were thrilled! (3) We received costume jewelry as donations and there was exactly enough for each girl. Each set of earrings, each ring and necklace matched the girls’ dresses perfectly. We could not have planned it better if we had tried! (4) We received $1500 in designated donations specifically for the quinceanera. The final budget for the quinceanera? $1500! (5) One of the girls at the orphanage was a young woman that Jordan and I had met 2 years previously (in another orphanage). She was deeply impacted by the quinceanera & we later learned that she had arrived at the government center 2 weeks before the quinceanera. (6) In previous years, there have been many challenging girls in the orphanage who bullied and threatened other girls. Miraculously, all of these girls were recently moved to other centers, which created a sense of peace and hope that we had never experienced before among the girls. 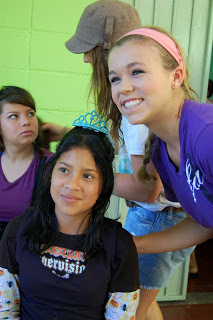 (7) The girl who inspired the vision for the quinceanera last year was still at the center. “Lady X” was able to shop for her own dress (see previous post entitled “Lady X”) and to our surprise, she stood up and spoke on behalf of all of the girls at the end of the quinceanera. She spoke with confidence and conviction, and seemed like a different woman. Lady X eloquently expressed the girls’ immense gratitude for all that they experienced throughout the week. We were nearly speechless to see this previously withdrawn girl, who did not fit into any of the dresses, rise up as a leader, speaking confidently into the microphone and expressing herself so passionately. (8) On the night before the quinceanera, the ministry team decided to reserve a samba band for the party. This entertainment ended up being one of the highlights of the night! (9) The singer deeply engaged the girls with her angelic voice and love for the Lord. She had them dancing, singing and worshipping God and the joy and freedom we witnessed as they sang together was indescribable. We later learned that she was a last minute replacement as another singer had to cancel. (10) Two of the translators, Lilly and Steve, decided to “MC” the party, just minutes before we began and they set the tone for the evening. They hosted the event like professional hosts, bringing laughter, joy and passion into all that they did. They spontaneously decided to interview the girls throughout the evening and asked them to share their impressions of the night. Needless to say, their comments were unforgettable. (11) To our shock, we collected enough dresses for every girl, their “tias” (caretakers), all of the missionaries, translators, and even the women on our team. I had not packed a special dress for the quinceanera, and it was such a surprise gift to be able to pick a dress that fit me perfectly! (12) Tanya decided to purchase some last minute decorations for the quinceanera at a 99 Cent Store. The decorations matched the colors and theme (unbeknownst to her) and added a special touch to the party. (13) It is currently the rainy season in El Salvador and the rain poured hard before and after the celebration. It just “happened” to stop for the entire length of the quinceanera. While the guys were setting up for the party, the rain was pouring. They decided to build a “backdrop” with a tarp and stage at the last minute, and it created the perfect setting and ambiance, which would not have been created if it hadn’t rained. (14) One of the Salvadorian missionaries, David Knepper, just “happened” to have a background in floral design. The flower centerpieces were gorgeous! (15) A family that has been in the process of adopting their daughter from El Salvador was able to participate in the week’s events. Maria, the adoptive mom, was able to assist with cooking the dinner since Susan Ackermann (our gourmet chef) wasn’t feeling well. 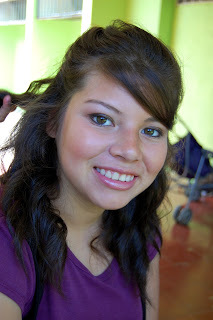 Aly, her adoptive teenage daughter, was able to pick out a dress and participate in the quinceanera. I met Aly two years ago while visiting her on behalf of All Blessings Intl. Adoptions. It was such a blessing for their family to participate in the quinceara, and Maria and Aly finally flew home to America today (at the same time that our flight departed). Congrats!!! (16) The director of Children’s Welfare and Social Services for El Salvador shocked everyone with his attendance. He addressed the crowd and expressed his gratitude on behalf of the government for all that we did for the girls. Wow! (17) One of our team members, Colleen, was able to produce an iMovie, highlighting the events of the week, in less than 24 hours! There were last minute cable issues, but we were somehow able to show the video and the girls loved it. For many of them, it was the first time ever seeing themselves in a video. (18) I was honored to speak at the church that we visited on Sunday morning and shared about the quinceanera. Although the members of the church are poor, the pastor challenged the members to collect an offering so that we could purchase a cake for the girls. We were humbled as we watched one woman with no shoes donate the coins from her pockets. We had just witnessed a "modern day widow's mite." They collected $35 and it was a beautiful, heart-felt gift. My journal is filled with many other miraculous stories that we experienced together this week. We have been humbled and privileged to be part of God’s transformative work in these girls’ lives. We are returning home with an increased sense of hope, faith and the powerful reminder of God’s redeeming love for every man, woman and child. On behalf of the team, I want to express our deep gratitude for the incredible amount of support that we have received throughout our journey. Thank you for your prayers, gifts, financial support, words of encouragement and for believing in us. 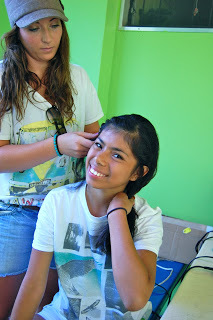 We have been changed but more importantly, 43 girls in El Salvador are new. Former prostitutes, gang members and criminals have finally understood their value and purpose through the eyes of a loving and healing God. They are no longer ashamed to gaze into the mirror, for they know that they are truly beautiful. These young ladies have been unified through their magical night together and the spirit and attitude in the orphanage is entirely different. We may be returning home to California tonight, but we have each left a piece of our hearts in El Salvador this week.